Protecting a company is no longer only about recording footage from a single surveillance camera at the front of a store. It is now commonplace to see retailers and small businesses looking for better options against shoplifting or under pricing at the counter. A video data management system (VDMS) can be a vital tool in this type of security protection. A criminal’s first eye-catching experience with a target is usually an unsecured retail store. It’s easy to pocket merchandise when there is only a single camera up at the front of the store, when no one is around, or even when the store is very busy. Having a quality turn-key surveillance solution, with well-placed video security cameras around the store, is the first line of defense that business owners need to depend upon. Just the mere fact of owning a system that is well placed and obvious to the customer can be enough to deter theft and shoplifting. Owning a proper, well planned security system saves time and effort, not to mention cost, when you don’t have to account for stolen merchandise or reduced pricing at the counter. A budget is always one of the biggest concerns in any business. Is it worth the price? Well, according to national police data, installing a quality security system can actually benefit a business and have a huge return on investment – this can be especially true for smaller business such as boutiques or restaurants. Want to know more? 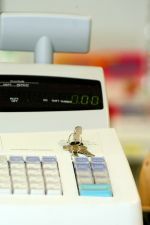 Learn more about the retail security solutions offered by Supercircuits.